Hello blog. It's been a while, but not a whole lot to report or maybe too much, which is why I've been avoiding you. I've eked out the Hodgepodge these past couple of weeks, but that's about it, and I'm determined to say something here today. Even if that something is essentially nothing. Who thinks I've spent too much time curled up under my super soft blankie watching mindless television on our overly comfy couch? Do you remember the blanket I got at our neighborhood Christmas party? That blanket y'all! It just might be one of my all time favorite gifts ever. I don't actually drag it around the house with me, but somedays I'm tempted. So the weekend. You know the drill-ridiculously cold temperatures that make you wonder why you thought dinner out on a Friday night was a good idea. On the bright side we did not get the foot of snow originally predicted, and instead we got a whopping none. I'll take it. We still have a couple of feet on the ground, frozen so solid you can walk across the top of the 'grass' without falling through. I'm pretty sure I'll be posting photos here in June of the 'big rock candy snow mountain' at the top of our driveway. Also, there's a lake out there, and benches in front of the water. ...or you can wait til July and see for yourself. I always say March is the hardest month of the year for me. I won't utter a word of weary complaint about snow in January or February, in fact I love it. But then you flip the calendar and it's like the word SPRING literally pokes you in the eye. It's March, and I need winter to begin tapering off. When you can't see so much as a blade of grass it's hard to imagine that happening, but it will. The earth will not be restrained by a little thing like a snow mountain. Seasons changing are one of God's very best ideas, don't you think? We do have a couple of fun things on the calendar which helps, because I need something to look forward to in March. Also, last week I managed to book a couple of small getaways for later this spring, and just seeing the reservations written in my datebook makes my heart feel lighter. We watched some of the Oscars last night, hubs would say too much, and I'm inclined to agree. I thought the show really dragged. I think Ellen DeGeneres is so funny, but even her bits felt like she was working too hard. I did think there were some beautiful gowns, and Charlize Theron is my pick for best dressed. She has the most amazing bone structure, and her hair, makeup, jewelry, and gown were flawless. I loved absolutely everything about her look. I stayed up too late for a Sunday, but I was thinking we'd at least wake up to the couple of inches still in the forecast, and my 6 a.m. boot camp would likely be cancelled. Where are those snowflakes when you need them? I dragged myself out of bed and the whole ride to the gym I kept thinking how next weekend we spring the clocks forward, which means the 5:15 alarm will actually feel like 4:15. Daylight Savings Time is all a big mind game isn't it? I did something similar last year for my daughters on St. Patrick's Day, only for theirs I used Mason Jars. FYI-it takes a whole lotta Skittles to fill up a Mason Jar. This time round I got smart and used pretzel bags. They are just the right size and hold the rainbow shape. The gold 'at the end of the rainbow' is actually four Rolos, which I think are like gold in their own way. Also, for anyone trying this at home, it seems a bag of Skittles contains a disproportionate number of red and orange as opposed to yellow. I used two big bags of Skittles for eight treat bags, and had to monitor the yellow. There's less purple too, but does anyone actually like the purple? Sunrise from my front porch. If we didn't have winter, would I still have this? Maybe not. And just when I feel bone weary of the cold gray winter skies God reminds me,"....for everything there is a season, a time for every activity under heaven." March on! 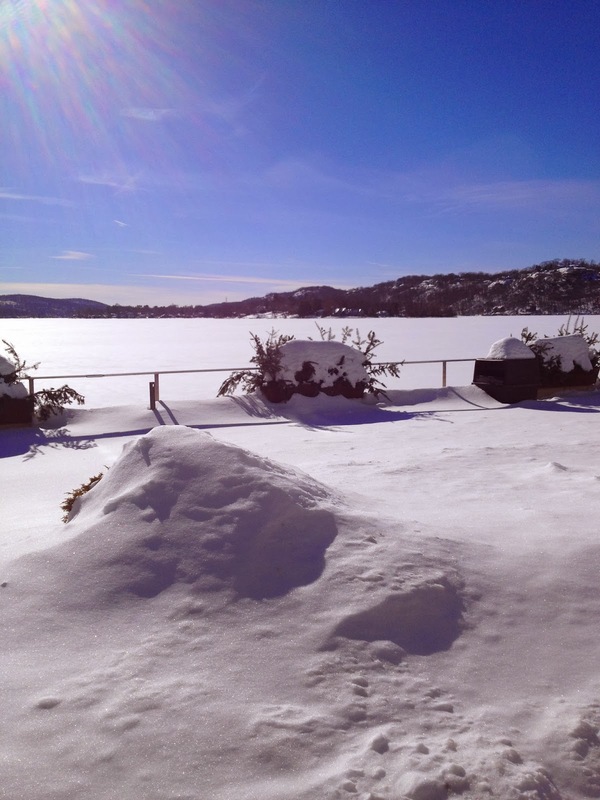 Is it the Winter that makes Blogging hard? I'm struggling myself. Eh. I also feel your pain regarding the snow thing. Only here it's liquid and I realize that's not as bad because at least one CAN drive in it and such. It's no fun but we're used to it. I keep reminding myself of those days in late Fall when all I wanted was weather worthy of boot wearing. Ha! Yes those pretzels bags work perfectly for treats like that. We have been having the much needed rain and it is so cleansing. Hope you start to get some melting soon and how exciting to have some trips to look forward to. I like the purple Skittles and just about anything grape flavored. So excited to see my man, Matthew, take home the Best Actor Award. I love him!! Hope y'all thaw out soon! Good tip on the pretzel bags. I couldn't agree more on Charlize Theron what a truly gorgeous woman. I felt the show took forever and that's with us taping it and then fast fowarding through most of the thank you speeches, commercials, and boring (soo many of them) award, lol. However, I did find Ellen DeGenere hilarious. Just the look on her face and I am giggling. I thought when she came out dressed as the good witch from Wizzard of Oz a riot. Hope your snow starts to melt soon. Enjoy your week! Oh, wrapped up in a blanket in the weather we've all had sounds like a plan to me. Such pretty pics! I love the pretzel bags! Will have to remember those. 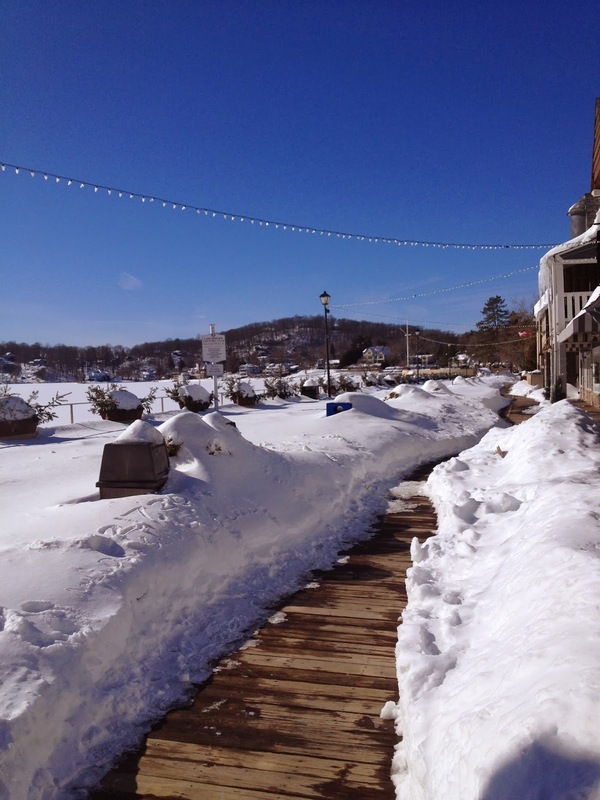 Thanks for sharing the pics of the boardwalk area… so pretty in summertime. But winter… ugh. I know you are ready for it to all go away! Really cute gift for the SF&N board members! Your rainbow gift bags are very cute....I will have to remember those. We are having some hints of spring, but will definitely see more snow before it really gets here. The sunrise picture is stunning. Beautiful sunrise. I have been noticing that the skies have been particularly beautiful this winter. Maybe it always has been, but I've really noticed them a lot this year.